Club Penguin Cheats by Mimo777 Club Penguin Cheats by Mimo777: Club Penguin Tree is Huge! It's getting even bigger! Wow, how much bigger do you think it get? wow! That is big! I hope it's gets really big and becomes a tree house! Maybe for a party? I think it will get so big that club penguin will put a door in it and make it and it will become a room! Maybe the tree growing and shrinking and growing fruits has something to do with the EPF? man! I was just about to tell u that! MIMO! I just saw the card jitsu water suit! It has water going threw it and the water dojo looks just like the fire dojo from the out side, but blue. Its probably going to get as big as a large sock filled millions of chocolate bunnies! It's the chocolate bunny tree! Whoa! That thing is huge!! 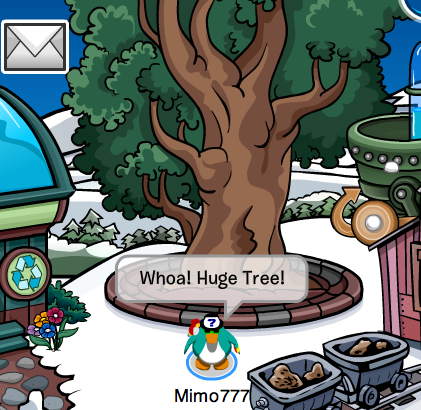 I wonder how it got that big... maybe herbert planted it and its going to take over the mine shack. I just had an awesome thought. Wouldn't it be awesome if you could dress your puffles up. It would be even more interesting if non members could do it too! I got the idea from the yellow puffle with a cape in the stage. Club Penguin had a bug where you couldnt log in or it just might of been my computer? Maybe it will become a tree house for member penguins! PS: my membership is finished so im in Ur side non-members! The tree is going to eat us all ! I think its going to be a tree house ect. and be a new room! i hope its gonna be a room! Did you hear there is a card jitsu water booster pack of cards coming out in november? that would be so cool! maybe you could contact club penguin and ask them! thats gonna be cool thats near my bday!!!! It was not just you. That happened to alot of ppl,and alot of ppl lost connection. I think it was because of the igloo storage! when are cpg mod changes? Maybe there might be plants growing out. Club penguin going healthy. Ew. Thats scary even talking about it lol. Remember kids eat lots of junk food. isnt it hard to tell mimo stuf? hey mimo can i use some of the party pics cause im in some of them? every one things it will be a tree house..mabey it will! cant wait for cpg changes! Hey thats... wait where did this sides thing come in? OMG MIMO! I was in the HQ when everything went all dark and then that tv turned on and it had all this random stuff like charts and pictures and codes, it was so weird!